MARK: MY WORD malbert@mmsonline.com Mark Albert EDITORIAL DIRECTOR MMS JULY 2018 18 mmsonline.com Smart About Manufacturing Dozens of conference speakers, numerous exhib- itors and thousands of attendees—add them together and that is about how many different definitions of "smart manufacturing" you could potentially encounter at the 2018 premier edition of the Smart Manufacturing Experience. Yet the event convincingly captured the scope and the promise of smart manufacturing, a broad concept that can be loosely characterized as "using data to do better." On one level, the event gave insights into how global manufacturing companies can use data to better manage their worldwide supply chains. On another level, the event gave insights into how even small job shops can use data to better manage machine setups and other basic functions. It behooves everyone in the business of making things to examine technology develop- ments on these vastly divergent levels as well as every level in between. This is important for two reasons. One, the technology for gathering data, keeping it secure, making it meaningful and turning it into positive action can be implemented in two directions. For instance, a shop could start by installing a sensor on a spindle to detect bearing conditions. It could then collect the data in a machine-health database to catch problems before the spindle fails. Finally, it could share the data in the cloud as part of a corporate-wide or industry-wide predictive-main- tenance system. Likewise, a corporation could start building an Industrial Internet of Things (IIoT) framework with provisions for remote asset monitoring (including predictive maintenance) that could result in directives to each production unit to install internet-enabled spindle sensors on every machine tool. For a second reason, every party that has a busi- ness connection with a manufacturing company anywhere on the spectrum from the corporate boardroom level to the shopf loor level will need a data connection, some sort of smart-manufactur- ing interface, to maintain the relationship as these manufacturers pursue their strategies for imple- menting data-driven manufacturing. Experiencing this emerging reality of using data to do better on every level was, I think, the main point and benefit of being part of this new trade event. My strategy to cover it was to concentrate on booths with machine tools on display. Of these, I've picked a small sample that is representative of this using-data-to-do-better theme. 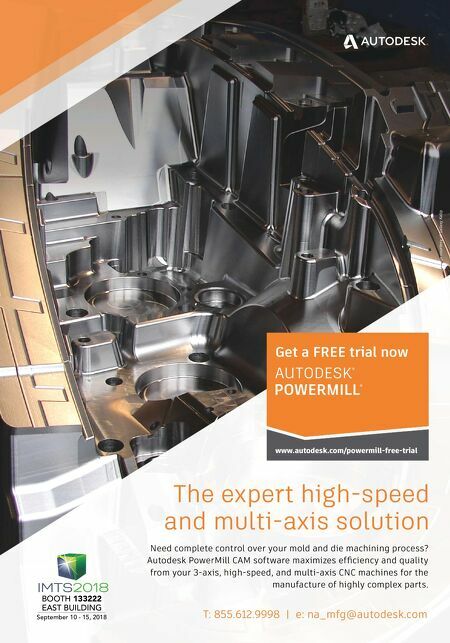 Methods Machine Tool's booth was truly a micro factory with machines for the complete pro- duction of a spinal implant, starting with a selec- tive-laser-sintering unit from 3D Systems to build up a batch of parts from titanium powder. Finished pieces were removed from the build plate with a RoboCut wire EDM, then robotically transferred to a RoboDrill machining center for a finishing oper- ation. Another station combined optical inspec- tion on a Vision Gage unit and laser marking on a The Smart Manufacturing Experience 2018 event in Boston provided a broad experience of what smart manufacturing can be like. 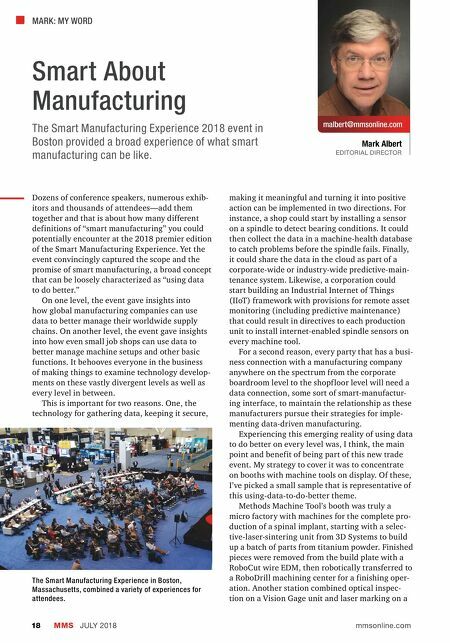 The Smart Manufacturing Experience in Boston, Massachusetts, combined a variety of experiences for attendees.